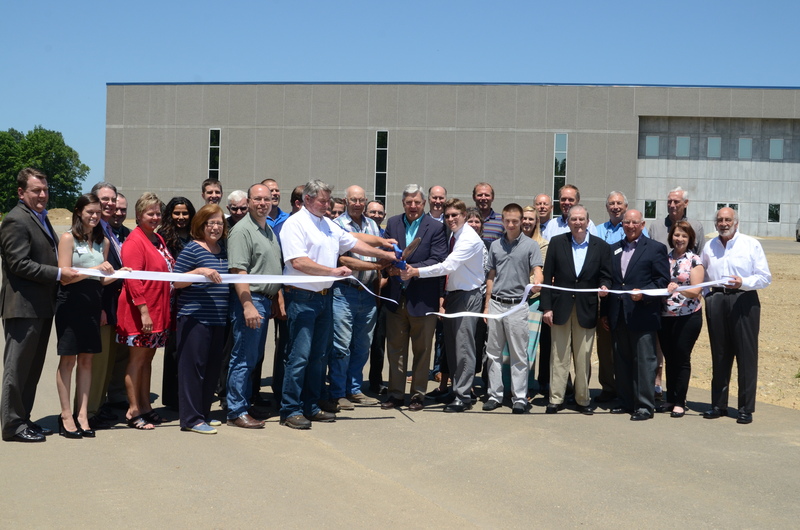 Many interested individuals attended the ribbon cutting of Warsaw’s Tech Park in July, on Polk Drive. city council members, redevelopment board members, Kosciusko County Chamber staff and ambassadors, contractors, KEDCO, Ivy Tech and representatives of Bradley Company who are marketing the building. Shown cutting the ribbon in front are Mark Dobson, chamber executive director, Andrea Reed, chamber; Stephanie Salyer, Mutual Bank; Cindy Dobbins, city council; State Rep. Curt Nisly, Dan Robinson, Tom Groninger, Mayor Joe Thallemer; Jeremy Skinner and Tim Dombrosky, city planning; Rick Snodgrass, redevelopment; Charles Smith, city council; Lynne Christiansen, clerk-treasurer; and former Mayor Joe Plank. WARSAW — Utilizing the 2015 year end review and 2016 goals for the Warsaw Building and Planning Department will assist in a city wide strategic plan with other departments. Jeremy Skinner, city planner, presented the end of year report to members of the Warsaw Common Council Monday evening, Dec. 21. The report states a strategic plan was completed four years ago by the council providing a road map for growth and development. The plan focused on six goals: growth management, business retention/expansion, business attraction, communication, downtown Warsaw and neighborhood revitalization. Projects focusing on these goals include the Warsaw Technology Park, the Market Street Project, Market Street Neighborhood Plan, The Buffalo Street Project and the new city hall. The plan commission will be involved with a number of planning activities including various ordinance updates. The redevelopment commission will oversee the marketing plan for the tech park and work towards developing phase two of that park. The goals and projects for the building and planning department include: updating various ordinances such as group housing definitions, complete streets, neighborhood preservation and rental registration and sexually oriented businesses; design, bid and construct side path connecting the tech park to CR 300N; and continue completing various bike and pedestrian master plan projects. Additional goals have been set for the tech park and northern TIF district. These include begin construction on the CR 300N bridge, complete engineering on the lift station, start engineering and construction on the pedestrian trail along CR 300N and start and complete the shovel ready program. Goals for the Husky Trail project include: complete right-of-way acquisition, complete stage three design plans, complete contract for construction management and bid project for construction. The goals for phase two of the Market Street project include completing stage one design plans, start environmental review and start the right-of-way engineering. The Buffalo Street Redevelopment Project goals include complete engineering for infrastructure improvements, bid and construct those improvements and work with developer to start initial residential redevelopment project. The final goal is the grade separation study. This includes complete the feasibility study and review the study for the next steps such as funding and a potential project partners. There were 420 permits issued in 2015, including 39 new home permits. The city experienced $6.5 million in residential construction and an estimated $10.8 million in commercial construction. Of the residential construction, there was approximately $1.1 million in remodels and additions, the remaining was new homes. The city inspectors completed well over 1,100 inspections for the year, issued 94 violation letters and processed 14 code hearing cases. Of those code hearing cases, three cases resulted in fines levied against the property owner and three demolitions were ordered. The department has contracted for two of the properties to be razed with the third property in the legal process. The plan commission reviewed 10 cases including the technology park subdivision, Park Ridge Phase Four, Briar Ridge Villas and other subdivisions. In addition the commission reviewed a number of potential ordinance revisions including: fence and accessory structures, setback and vision clearance and FEMA ordinance update. The board of zoning appeals reviewed 22 variance, special exception and development standard requests. Some cases prompted the plan commission to look at ordinance updates. The redevelopment commission had a busy and successful year. The 64,000-square-foot shell building in the tech park was completed and a marking plan put into place. Phase one of the park was opened and construction of a 45,000-square-foot manufacturing facility for Banner Medical is underway. With the completion of Winona PVD’s second expansion, the commission completed another bond issue to help with the third expansion project. Excluding the shell building the tech park will see $20 million in new manufacturing facilities and equipment in the next year. The redevelopment commission also took steps to extend the life of the Central Redevelopment District until 2040. The Buffalo Street project will strengthen the core of the downtown district with a mixed-use project while protecting the future of the redevelopment district. Completed projects included the construction of industrial shell building, construction on phase one of the technology park, construction on the market street reconstruction project phase one, Buffalo Street bond issue with engineering begun on infrastructure improvement project, submitted the stellar communities application, submitted projects for Northeast Indiana Regional Cities Application, and completed phase three of the Winona PVD bond. There was also the completion of the the Mariners Drive reconstruction project. In addition to accomplishments previously noted, the department has started: engineering on phase two of the market street project; presented various ordinance changes; started right-of-way acquisition for Husky Trail Project; started engineering lift station for phase two of the tech park; and designed and bid the Eisenhower Neighborhood street light project.